As programme officer I provided support to the branch office in the Central Rift Valley. Here, HoA-REC promotes integrated land and water management in close collaboration with government, private sector and members of the Regional Environment Network. The Central Rift Valley programme, which is funded by the Dutch Embassy, addresses the pressures causing deforestation, land degradation and water quality deterioration. 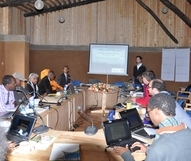 It aimed to safeguard critical ecosystem services upon which rural livelihoods depend as well as conserve the unique biodiversity of the Rift Valley ecosystem. Secondly, I was involved in promoting a transboundary watershed programme that will be implemented in the Horn of Africa through the Regional Environment Network members. Lastly, I assisted to organise the alumni network for those persons who have been enrolled in a water-related study in the Netherlands. As a human geographer, I am passionate about the coming together of different development initiatives and actors in a geographical space, and the challenges and opportunities that are created in the process. I am always eager to stress the importance of seeing developments from a system perspective. To find out how ecosystem services and biodiversity can thrive while sustainable livelihood opportunities are created is what drives me. In doing so, I consider myself pro-active, analytically strong and committed.